Consider the lowly catfish. With its long, whisker-like barbels and flattened face, it might not be the prettiest fish swimming in Minnesota’s waters. But more and more anglers around the state are finding it an attractive species, both for sport and for the frying pan. Once stigmatized as common river dwellers that were unappreciated at dinner time, catfish have been growing in popularity as people learn that they’re fun to fish for and good to eat, as long as you follow the same consumption advisories that apply to other fish. Some of those changing perceptions are the result of fishing shows that have highlighted catfish angling, and the many high quality opportunities easily available in Minnesota. When Stiras mentions “fish of good size,” he’s not kidding. While the state record for walleye is 17-1/2 pounds, channel catfish weighing 20 pounds are not uncommon in some of Minnesota’s large rivers. And 30- to 40-pound flatheads – the other species of catfish in the state – are well within reasonable expectation on the Minnesota River and elsewhere. The state record for a flathead catfish, caught on the St. Croix River in Washington County, is 70 pounds – about the size of an average 10-year-old child. While rivers are the best place to fish for big catfish, the DNR also stocks channel catfish in about two dozen lakes around the metro region to provide close-to-home angling prospects. To find an interactive map go to the Catfish in the Metro webpage. Channel catfish will eat almost anything. Nightcrawlers are commonly used for bait, or anglers can try “Mario’s magic,” as recommended by the DNR’s Travaline: Cut some cheap hot dogs in half, put them in a zip-close bag along with some garlic powder and a package of red or purple gelatin mix, and let it sit overnight. Slip the hot dog on a hook with a weight above and put it in the water. Flathead catfish are predators and respond best to live bait – a bullhead, white sucker or creek chub works well. Look for areas where faster currents are broken by fallen trees, logs and rocks. May to early June offers some of the best catfish action, and flatheads tend to be more active at night. The season for flatheads runs from April 1 through Nov. 30, while channel cats can be caught year-round. Anglers can have a total of five catfish in possession, but only two can be flatheads, and only one can be bigger than 24 inches. The Red River of the North is nationally recognized as a great place to hunt for big channel catfish. The 240 miles of the Minnesota River from Granite Falls to Fort Snelling is the best place in the state to catch flatheads, and it’s an excellent choice for channel cats as well. And with four state parks and numerous other public lands along its course, finding a place to launch a boat or fish from shore is easy. 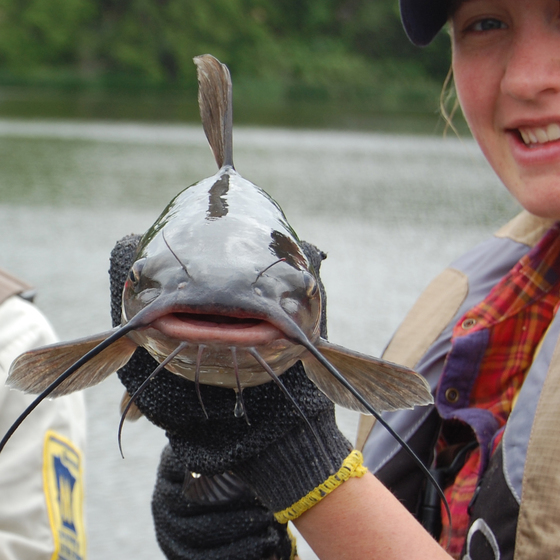 Minnesota has two species of catfish: Flathead catfish and channel catfish. The state record flathead catfish weighed in at an even 70 pounds, and was caught on the St. Croix River in Washington County in 1970. The state record channel catfish was caught on the Mississippi River in Hennepin County in 1975, tipping the scale at 38 pounds. Flatheads tend to return to the same site to overwinter in large groups of fish that remain so stationary that sediment accumulates on them. After spawning, the male flathead drives the female off the nest, which he then guards, fanning water over the eggs until they hatch. Contrary to popular belief, catfish don’t sting people with their barbels (the long whisker-like appendages around their mouth). They do, however, have sharp, stiff spines along their dorsal and pectoral fins (the ones on the top and sides of the fish). Anglers can easily be poked by these spines if they don’t handle the fish appropriately. Catfish have been described as “swimming tongues” because they have taste buds on their barbels, along the sides of their bodies, and near their tails. These help them locate food in the murky water of rivers.